Old St. Mary’s traces its roots back to 1833 as the first catholic parish in the area when approximately 100 “Catholics of Chicago” sent a petition to the Bishop in St. Louis requesting a pastor. This Saint Mary’s parish would soon become the first cathedral parish of Chicago and that designation would last until the fire of 1871. The Paulist Fathers took over the parish in 1903. Our present location is the sixth site. All have been located around the Loop area of the city. Guided for more than a century by the vision of the Paulist Fathers, we are a diverse and welcoming community dedicated to serving the spiritual needs of the Loop, South Loop and the greater Chicago area. 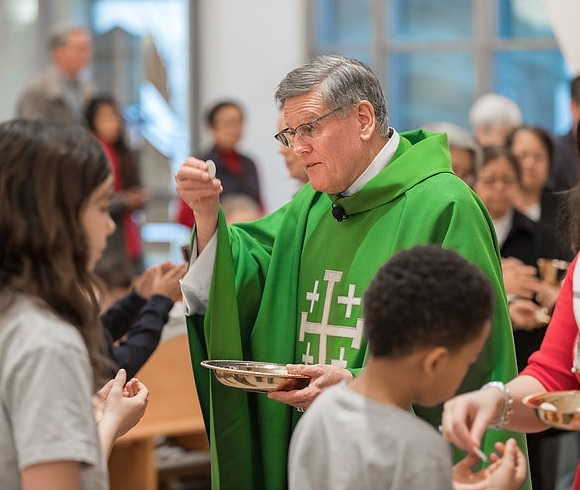 As a unified Church and School community, Old St. Mary’s Parish promotes the mission of the Paulist Fathers to welcome those who have been away from the church, to build bridges of respect and collaboration with people of diverse backgrounds and religions, and to promote justice and healing in our society.